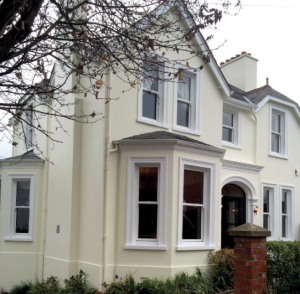 Turkington Windows recently completed the replacement of a variety of PVC windows in a large Victorian house in Belfast. The property, which was built in 1888, had previously installed PVC windows but these had come to the end of their working lifespans. They were now old, cold and draughty and in need of replacement. Turkington were called in by the property’s owner, Mr. Truesdale, to update these old PVC windows. It was particularly important during the renovation that care was taken to maintain the period character of the home. This meant paying particular attention to the renovation of the existing internal timber surrounds of the windows when carrying out the half-box replacements. Overall, the project required us to replace approximately 18 old PVC windows. The windows we installed were new PVC sliding sash windows. These were ‘A’ rated for energy efficiency, and were accredited ‘Secured by Design’, making them both great thermal insulators and incredibly secure.